Winter is fast approaching and we are remembering the warmth and beauty of springtime with great affection. To keep these warm memories blooming, I am offering the wool painting “Butterfly in flowers” at a reduced rate. The delicate pink and lavender blossoms and the graceful butterfly in this colorful picture will surely bring a touch of spring to your home, during the cold winter season. Wool painting “Butterfly in flowers” would make a perfect birthday present or be a loving gift during the holiday season. It would also make a thoughtful gift for a lover of flowers and nature. 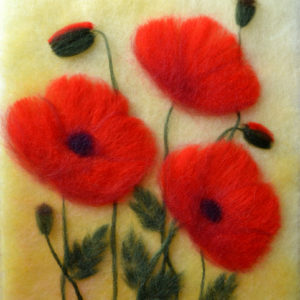 The wool painting “Butterfly in flowers” is an original artwork. Painting size: 14 x 11 inches (35.6 x 27.9 cm). Painting is nicely framed in an black frame and ready to hang. Overall size: 14 ¾ x 11 ¾ inches (37.5 x 29.8 cm).